This summer I did some whale watching in Alaska. Whales are fascinating creatures. It was fun to be part of a crowd hoping to catch a glimpse of a whale jumping out of the water. The whale watching guide on the boat explained that you can tell if a whale is nearby when you see a spout, like a puff of smoke on the horizon. 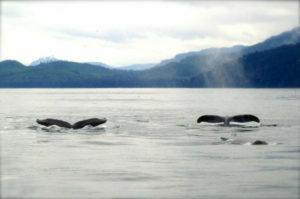 It’s when the whale exhales at the surface of the water–an exciting clue before the whale might appear minutes later. She explained that the whale could appear in the same area or it might swim under the boat and breach on the other side. You really don’t know when and where it might appear. No guarantee you’ll see it. Happy to report we saw a few humpback whales on the excursion. And so it goes with business. Opportunities are everywhere in your business. They are closer to you than you think and bigger than you realize. But you may not be paying close enough attention or you may be fixated on the wrong signs. As an inexperienced whale watcher, I was getting excited about all the unusual ripples on the water. Every time I saw a different pattern in the water, I’d point it out. Everyone on the boat rushed to the edge. “Gayle, that’s just more salmon.” I knew I’d become annoying. Here are a few lessons from the whale watching experience that can help you in your business. Don’t become too focused on just one opportunity. If it doesn’t materialize, it probably isn’t meant to be, at least not for now. I’ve seen some executives invest massive amounts of time, money and energy in a single potential opportunity that seems to have failed. Could be a new venture, project or relationship. They either take it personally or can’t seem to let go of the disappointment. Believe there are other opportunities out there. Tune your radar. Broaden your view. Once you know what you really want in your business (or in your life for that matter), it’s natural to want it NOW. The whales dive below the surface until they are ready to reemerge. If the opportunity you want is not happening quickly enough, it might mean that you need to do something more to be really ready for it. Are you going along as part of a pack, like salmon swimming upstream? Making things harder for you or your business than they need to be? The irony is that you don’t have to work harder to make a big splash. The whale makes a big splash by doing what it does naturally and effortlessly. Be more of who you are naturally. Don’t be afraid to break away from the pack. You don’t have to be loud, but you do need to do something differently to attract more attention and business opportunities in your market. As a leader, do what you need to do to make your voice heard. You’ll create better leadership opportunities as well. You’re in charge. As the captain of your ship, what are you doing to achieve big results and create a positive ripple effect in your organization? Some of my clients are assessing their crew–letting some people go and hiring talent that’s a better fit. Some are tired of being at the helm and are looking for another boat or a place to dock for a while to reassess things and re-energize. Others are finding new waters for their business or organization to explore. All are opportunities when you choose to view them through an optimistic lens. Take the next step to be ready for new fascinating opportunities–those you anticipate and the ones that will appear out of nowhere. They are closer than you think! Now is the time if you’re having a leadership or company retreat this fall or winter. 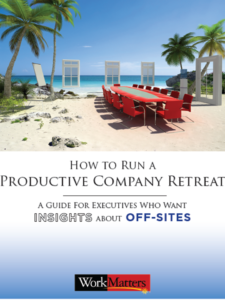 As a reminder, I created a free special report to help you make your next company retreat most productive. If you’ve read it before, you might need a refresher. If you’re new to my list, I often create valuable resources like this for executives and business owners. This special report offers useful insights about off-sites. And if you need my help leading or participating in your next retreat in some way, please let me know as soon as possible. My calendar is filling quickly. Communication Breakdown Slowing You Down? How to Address the Real Problem with "Problem Employees"
Gayle Lantz is a leadership consultant, speaker, author and founder of WorkMatters, Inc. She works with organizations, executives and top performers who are serious about growing their business and themselves.. Losing Patience Reaching Your Goal? Copyright © 2018 WorkMatters, Inc All rights reserved.